Buy CP Laser Cricket Bat,a grade 1+ bat with laser engraved branding. AVAILABLE WEIGHTS: 2lb 7oz, 2lb 10oz & 2lb 11oz. The Very Top Bat in the CP range, made from the very best Grade 1+ (Pro Grade) English Willow. Extremely Limited Edition Cricket Bat. Stunning Laser Engraved Branding - on both the face and back. Gold, English Made Chevron Grip. Full Length CP Laser Padded Bat Coffin (worth around £40) included for no extra cost! 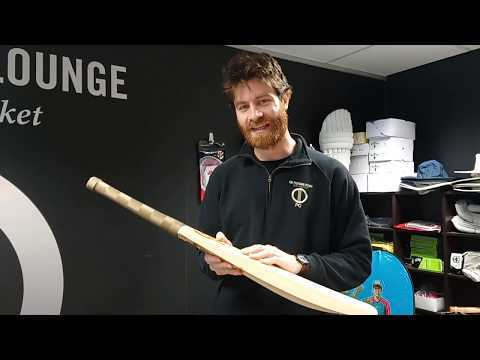 A new cricket bat for 2019, and made in England, the CP Laser Cricket Bat is the very top bat in the CP range, made from the very best Grade 1+ (Pro Grade) English Willow. An extremely limited edition cricket bat, the CP Laser Cricket Bat features stunning laser engraved branding on both the face and back, which gives it a distinct and ultra premium look. The low middle and thick toe makes the CP Laser Cricket Bat ideal for front foot play and use on slow and low pitches, and the minimal concaving and very thick (38-40mm) edges ensures a wide sweet spot. The CP Laser Cricket Bats will have 11+ grains, so stunning looks are guaranteed! In addition, a full length CP Laser Padded Bat Coffin (worth around £40) is included for no extra cost, to protect your investment!